WASHINGTON (CNN) -- Justice Ruth Bader Ginsburg, the only woman on the Supreme Court, had surgery Thursday for early stage pancreatic cancer, the Supreme Court announced. Justice Ruth Bader Ginsburg has undergone two bouts of cancer since she joined the court in 1993. Ginsburg, 75, is at Memorial Sloan-Kettering Cancer Center in New York, the court said in a news release. It said she will likely remain there for seven to 10 days, according to her attending surgeon, Dr. Murray Brennan. "Justice Ginsburg had no symptoms prior to the incidental discovery of the lesion during a routine annual checkup in late January at the National Institutes of Health in Bethesda, Maryland," the court said. A CAT scan "revealed a small tumor, approximately one centimeter across, in the center of the pancreas," the release added. The court returns for public oral arguments February 23, after a month-long break, but justices are also scheduled for a closed-door conference February 20. There is no word whether Ginsburg will attend in person, or if she will eventually have to curtail her workload. 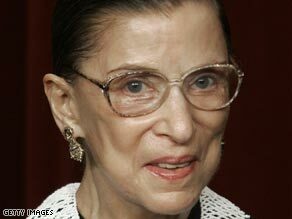 Ginsburg previously underwent surgery for colorectal cancer in September 1999. Court sources said she continued to work on pending cases while in her hospital bed and during her subsequent recovery. Less than a month later she appeared in public to give a speech and said, "I am still mending but have progressed steadily." She never missed a day on the bench. She received chemotherapy between October 1999 and June 2000. There was no word on her future course of treatment beyond Thursday's surgery. President Obama wished Ginsburg a speedy recovery, offering his thoughts and prayers, said White House Press Secretary Robert Gibbs. She is the second oldest justice on the high court, after 88-year-old Justice John Paul Stevens. "Cancer is a dreadful disease," Ginsburg told a women's health research dinner in 2001. "The surgery, and what I call the post-operative insurance course (chemotherapy and radiation) are not easy to bear physically and can generate large anxiety." But, Ginsburg added, "there is nothing like a cancer bout to make one relish the joys of being alive. It is as though a special, zestful spice seasons my work and days. Each thing I do comes with a heightened appreciation that I am able to do it." Ginsburg's mother died of cancer the day before the future justice graduated from high school. Her husband was diagnosed with cancer while she was in law school, but was successfully treated. Almost 35,000 Americans are estimated to have died from pancreatic cancer in 2008, making it the fourth leading cause of cancer death overall, according to the American Cancer Society. For all ages combined, the one-year survival rate is 24 percent; the five-year survival rate is 5 percent. However, it is not often discovered in the early stages, because symptoms usually do not appear until the condition is advanced. Ginsburg, considered one of the more liberal jurists on the bench, was appointed to the Supreme Court in 1993 by President Bill Clinton. She is the only woman serving on the high court, and the second ever, following Justice Sandra Day O'Connor, who served from 1981 to 2006. Ginsburg was nominated by President Jimmy Carter to the U.S. District Court of Appeals, where she served from 1981 until her nomination to the Supreme Court. CNN's Andrea Kane contributed to this story.